April 3, 2016 by Alexa C.
Fate/stay night and its associated franchise seem to be pretty iconic among anime and Japanese video game fans. I’ve known about the series for quite some time, but didn’t engage with it until late 2011, when I watched the godawful 2006 anime adaptation. My interest in Fate waned for some time after until I watched the Fate/Zero anime adaptation, which rekindled my attention to the series. A year later, I noticed that fellow writer Franklin Raines had gotten his hands on a copy of the PSP game Fate/Extra; he expressed little interest in playing it at the time, but allowed me to borrow it in his stead. I was intrigued by this ditty of a PSP game, but how did it unfold in the end? We’ll see. Fate/Extra was developed by Type-Moon and Imageepoch, and was originally released in North America in late 2011. Type-Moon is known for the visual novels and games they produce, including Tsukihime and Melty Blood. Imageepoch developed several RPG series since 2005, such as Luminous Arc and 7th Dragon, before filing for bankruptcy earlier this year. …isn’t that what I’ve already been doing, though? 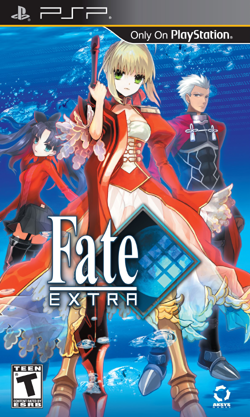 Fate/Extra is an alternate universe spin-off of the main Fate/stay night franchise. In the game’s setting, magic has mysteriously disappeared from the world, with individuals now needing to utilize a virtual reality system called the Moon Cell to engage with magic. The Moon Cell hosts a fictional high school called Tsukumihara Academy, which serves as the battleground for the most recent iteration of the Holy Grail War. In the Holy Grail War, individuals known as ‘Masters’ summon ‘Servants’, magic-enabled figures from various world mythology and history, in order to fight in an elimination tournament. 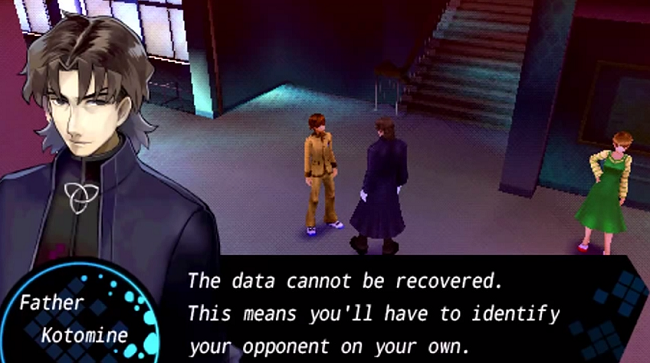 Rival Masters and Servants fight every week, with the winner advancing forward, and the loser having their data deleted from the Moon Cell and getting killed off – in real life. The ultimate winner of the Grail War may have a wish granted by the Grail itself. The protagonist of the game is a student of Tsukumihara Academy who has no memory of their past, and who ends up getting thrust into the Holy Grail War for reasons not their own. After barely surviving through the War’s preliminary testing round, the protagonist can summon one of three servants to fight for them: the proud and pompous Saber; the cool and collected Archer; or the coy and elegant Caster. Ultimately, the protagonist must fight and survive through the Holy Grail War while also investigating into the mysterious circumstances that brought them into the War. She’s crouching in this shot, but Saber is REALLY short, even compared to the female protag. 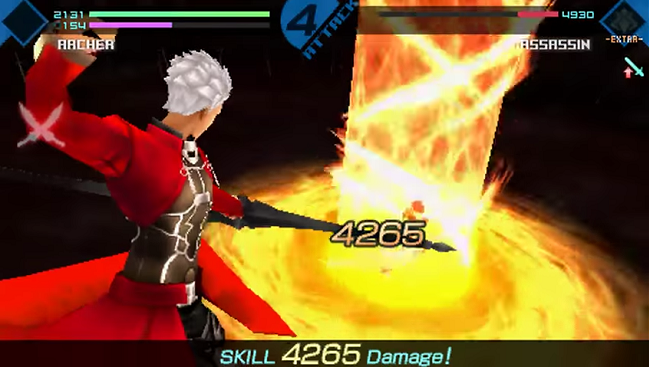 Fate/Extra is primarily a dungeon-crawler RPG with its own twist on a turn-based battle system. The game primarily utilizes a rock-paper-scissors style of inputting attacks, which consist of ‘attack’, ‘guard’, and ‘break’: attack beats break, guard counters attack, and break shatters guard. You input six of the attacks per turn, then your Servant and the enemy will clash and deal damage to each other based on their move-set. As your Servant levels up, they can use special magic skills in lieu of the standard attacks, and the protagonist themselves can cast support magic to heal their Servants or disrupt enemy attacks. However, most enemies and Servants will not have most of their move set shown for you to easily counter them, requiring some strategizing to ensure your Servant isn’t taking on tons of damage at every turn. Fighting enemies in dungeons repeatedly will usually open up their entire move set, but rival Servants usually will only show 2 or 3 of their attacks per turn. 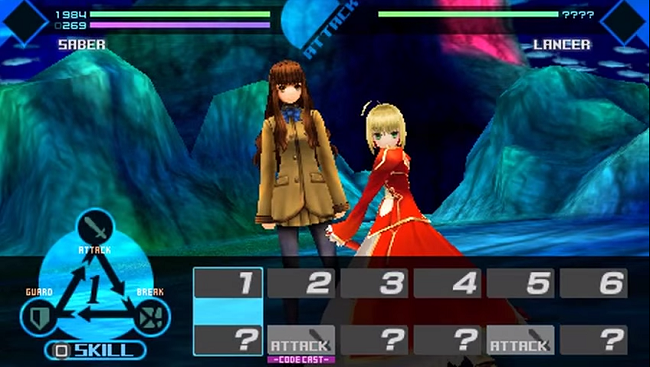 The luck-based element of Fate/Extra’s battle system can get rather frustrating, especially in later levels, and if you’re struggling, prepare to put some time into level grinding to compensate for it. The other half of Fate/Extra‘s gameplay consists of a simulation-esque game (think Persona 3 or 4) where the protagonist can freely roam around Tsukumihara as the story progresses. Around the school, you can buy items for your dungeon escapades, allot points to your Servant’s stats, and converse with various NPC’s as the story progresses. A rather notable feature (and my personal favorite) is the Servant’s room, where you can discuss the battles at hand as well as the Servant’s true identity. The individual Servant rooms are designed around the Servant you choose: Saber has a classy, private theater-esque room, Archer has a messy room with classroom chairs and desks strewn about, and Caster’s room resembles a traditional Japanese tearoom. The Servants’ rooms can also be customized slightly by means of doing fetch quests for your homeroom teacher Taiga, who will give you aesthetic items that are automatically placed in your Servant’s room. Small details like this customization help to give Fate/Extra its own level of distinctiveness from many other RPG’s. As cool as this looks, Archer requires a good deal a finesse and a bit of luck in order to deal damage consistently. Fate/Extra‘s story and characters are rather robust and, despite the initial setting, manage to not dip excessively into the more obnoxious side of an “idealistic anime fantasy high school” backdrop. The protagonist, in particular, is established rather quickly as a snarky yet poised individual rather than a silent protagonist with the personality of a blank sheet of paper. As a result, the protagonist has some opportunities to make some entertaining conversation with their Servant, such as the near-perpetual sass-fest going down between my protagonist and Archer.While you are still going to deal with tsundere-incarnate Rin Tohsaka and egotistical class rival Shinji Matou, many of the Servants and Masters in the game are surprisingly varied in terms of design and personality. For example, the second Servant/Master pair you face in the game is Dan Blackmore and his Servant Archer; the former is an elderly yet hardened veteran soldier whose appearance contrasts with the latter’s clean, bishounen looks. Later in the game, you might encounter the deranged duo of creepy cannibal clown Lil’ Ronnie and her Servant, the gruff and masochistic Lancer. If you were expecting the game to be full of teenagers fighting each other to death in a virtual setting, you’ll be pleased to know that the game instead throws plenty of actual adults into the fray. Pros: The game’s story and setting is open enough that newcomers to the Fate franchise can enjoy the game as much as veteran fans. The protagonist is genuinely interesting, has a distinctive personality, and keeps the story engrossing. 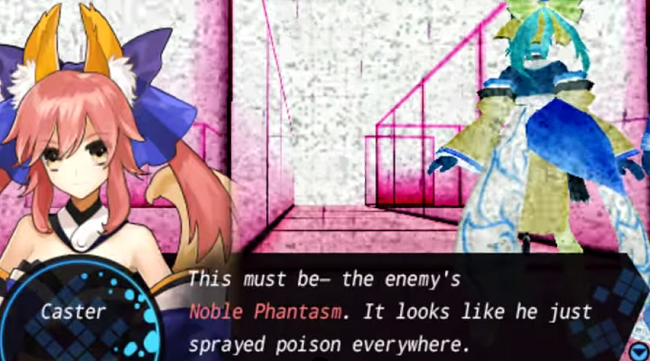 The various rival Servants and Masters encountered throughout the game are actually very noteworthy (and sometimes tragic) characters who add well to the game’s setting without falling too deeply into the more obnoxious “anime fantasy high school” archetypes. The number of rivals in this game who DON’T attempt to preemptively strike you can be counted on one hand. Cons: The game’s battle system can get frustrating to deal with and focuses a bit too heavily on luck. The game mandates level grinding at certain points, more so if you are having trouble with the battle system. Some of the game’s attempted world-building gets rather muddy and a bit hard to follow. The confrontation with the game’s final boss gets extremely dialogue-heavy out of nowhere, and lessens the overall impact of the sequence. Fate/Extra is published in the U.S. by Aksys Games. While Fate/Extra has its fair share of gameplay hiccups, I was impressed by the depth of its story and general character variety. If you’re a returning fan of the Fate franchise or a newcomer intrigued by the surface aspects of the game, I would definitely say it’s a lesser-known PSP title worth looking into. This entry was posted in Past Gen and tagged Fantasy, Fate/Extra, Imageepoch, Kinoko Nasu, RPG, Type-Moon. Bookmark the permalink.